excerpt from "Where Wild Plum Trees Grew"
In 1803, Alexander Logan became the third owner of land (in what became Plum Borough) under a grant from the English government in 1769 to John Little. This grant of land made up all of Logans Ferry and Parnassus. Mr. Alexander Logan owned a store and an inn, and the Logan family operated a ferry from Logans Ferry across the Allegheny River to Springdale. It is from "Logan's" ferry that the area, a church, and this mining town derived "Logans Ferry." 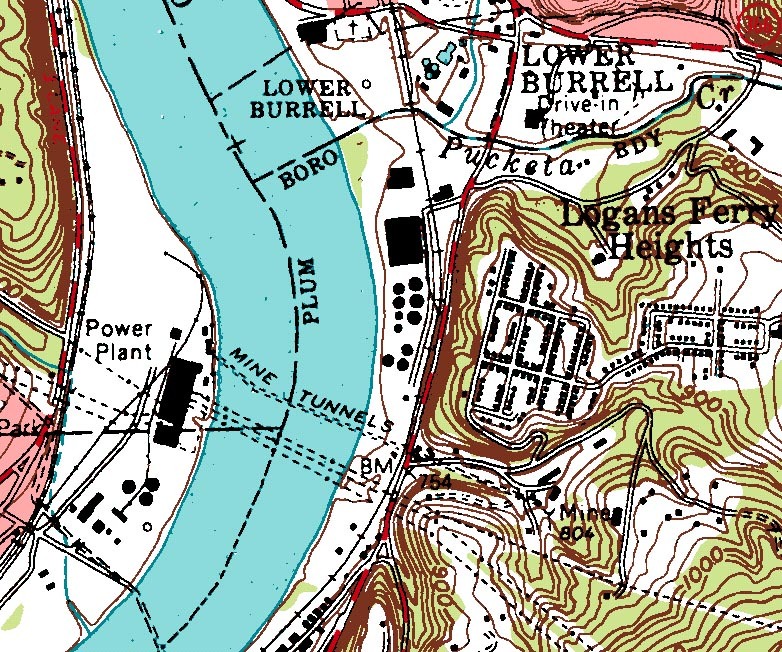 In 1918, because of the demand for power for the production of war materials, and with the expectation of a rapid expansion in the use of electric power after the war, a site was selected along the Allegheny River near Springdale for the construction of an electric power plant. Construction of the Springdale Power Station was started under a contract with the United States government. However, World War I ended before the power station was placed in operation. The company then faced the problem of providing sufficient coal for Springdale's operation. To overcome this problem, A.M. Lynn, president of West Penn Power Company negotiated a lease with the Youghiogheny and Ohio Coal Company for coal lands in Allegheny and Westmoreland Counties. This lease was assigned to the Allegheny Pittsburgh Coal Company, a subsidiary of West Penn Power Company, and the "Springdale Mine" was developed to supply coal to the Springdale Power Station. In 1919, the "Springdale Mine," better known as the "Logans Ferry Mine," was opened. The mine was always referred to as the "Logans Ferry Line" because of its location in the area, and because the men actually entered into and departed from the mine on the Logans Ferry side of the river. 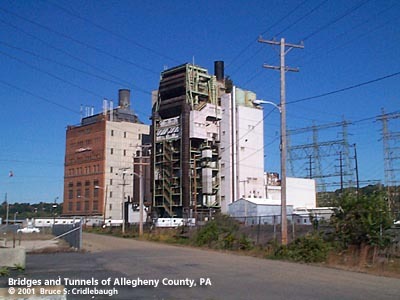 The development of this coal land presented an unusual and interesting engineering problem, and it was decided to drill a tunnel under the Allegheny River to convey the coal from the mine to the power station in Springdale. Actually, there were two tunnels drilled for transporting the coal to Springdale, one tunnel for the loaded cars of coal going, and one tunnel for the empty cars returning. A rotary dump was used on the Springdale side to turn the cars upside down so the coal could be dumped and then hoisted to the surface. The tunnel was completed and dedicated in 1921. All the coal produced in the Logans Ferry mine, with the exception of miners own home consumption, was shipped to Springdale for West Penn Power's exclusive use. Allegheny Pittsburgh Coal Company built 201 company houses above the mine portal at Logans Ferry. The homes were sold to the residents in 1949 and the town name was changed to Logans Ferry Heights. In 1953, the portal was moved about four miles east to Milligantown in Upper Burrell Twp, Westmoreland County. The new entrance was used until the mine closed permanently in 1968. Where wild plum trees grew: bicentennial edition of Plum Borough history, 1788-1988. Allegheny Foothills Historical Society, c1988. Submit info or inquiry - share some facts or ask a question.